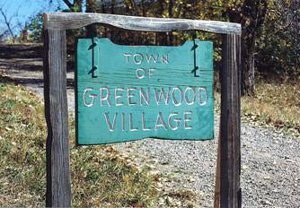 Greenwood Village, Colorado is in Arapahoe County, immediately south of Denver, encompassing 8.3 square miles. It was first incorporated as a town in 1950 and received its home rule charter in 1968. Greenwood Village is a city described as vibrant, progressive, and focused on quality of life. It is a distinct community of families, business leaders, and professionals who enjoy life to the fullest in a backdrop that combines natural beauty and careful planning. From the unspoiled beauty of a quiet country meadow to contemporary loft living, to traditional subdivisions, to world class business environments, the Village has it all. Originally the Village was a quaint collection of orchards, dairies, farms, and gravel roads. Today there still exists the charming country ambiance in the form of an extensive system of interlacing parks, greenbelts, parkways, and biking, hiking, and equestrian trails. Along the 40 miles of trails that wind through the Village are frequent wildlife sightings, waterways, remnants of historic structures, colorful gardens and magnificent mountain views. These trails connect with a regional network reaching to Downtown Denver, Cherry Creek State Park and Reservoir, the South Platte Valley, Chatfield Reservoir, and beyond. Whether you are enjoying an ice cream sandwich during Greenwood Village Day, relaxing at one of the summer concerts in the park or creating a lasting memory at one of the many recreational locations, you will find that the Village offers something for everyone. On wheels, on horseback or on your own two feet, recreational opportunities abound for the outdoor enthusiast on a year-round basis. Through cultural activities at the Curtis Arts & Humanities Center you have the opportunity to learn a new skill or develop an existing one, share laughter with friends and family, and encounter a distinctive educational experience. The Village works to bring the community together through these experiences with the intent that the relationships you build will be fulfilling and last a lifetime. See below listings of Greenwood Village homes for sale.